Home Behaviour	#NakedTeachingDay What are you doing it for? #NakedTeachingDay What are you doing it for? How are you feeling about #NakedTeachingDay? Are you excited? It’s a bit different and you’ve got something planned that you just know the kids will love! Maybe you are nervous? You’ve got your ideas together but you’re scared you will pull out the pens and paper when the blank space gets too much. Or are you petrified? Your behaviour management isn’t the strongest anyway and the thought of not having a screen to hypnotise them is just too much. Whatever you are feeling, use it to remind you that there are educators out there that work like this every day. The idea of stripping back resources came from wanting to do something big for the schools out there that have nothing. WWEP work tirelessly to bring high quality learning to marginalised and disadvantaged youth in developing, disaster and conflict affected countries. “If you can do something then you should” and, by taking part in #NakedTeachingDay, you are! Developing ideas for how we can educate when there are no resources. These ideas can be taken out to the places that WWEP are working to support the educators out there. Myself and Crista Hazell are travelling to Ghana on the 15th of October. We will be sharing your ideas with the teachers of the SOS villages and beyond. We will be documenting our journey so keep an eye out for your idea making a difference! WWEP also have volunteers in places such as Calais (the jungle), Nepal and Kakuma to name but a few. Your ideas will make a difference. Raise funds to provide school supplies such as containers of classroom furniture. The containers not only provide the basics such as tables and chairs but they can also be used as actual classrooms! We are half way to our target of providing a container during our trip to Ghana. A massive thank you to all who have contributed so far. Especially Vision for Education and Framwellgate School, whose generous contributions have made a huge difference. 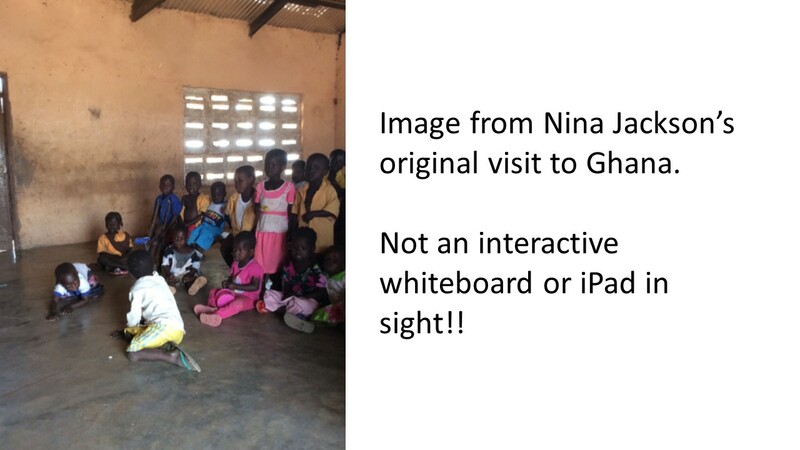 To the individuals who have spared anything from £1 – £20 by getting #Naked4Ghana, we are truly grateful! Non teachers are getting involved too. My Mam even got #Naked4Ghana by pledging to give up her shoes for the day and getting sponsored £40 for the privilege. If you are unable to donate online, cheques can be sent directly to WWEP. Message me for details. If you are taking part in #NakedTeachingDay on Friday, please remember why we are doing this. Use your nerves and fear as a way of empathising with these teachers. Think about what you could do to help. Don’t feel bad if it goes wrong and you revert back to resources – just remember that some people don’t have that luxury. Spare a thought for those educators who do not get to choose to put down their tools, but who have no tools at all. Share your exciting ideas (simple ideas are good too) with us: blog, video, photograph what you are doing so that we can pass them on where they are needed. If you raise any money from your efforts or if you feel you can spare a little of your own, it can be easily donated through the Just Giving page below. Finally, if you are taking part, in any way, THANK YOU!! !